Se você estiver passando algum tempo na Big Island, essa excursão de um dia é obrigatória. Saia de Hilo para uma aventura no Parque Nacional de Vulcões do Havaí para ver o Kilauea, um dos vulcões mais ativos do Havaí. Faça algumas paradas no Richardson Beach Park, na Cachoeira Rainbow e na Mauna Loa Macadamia Nut Factory. Veja por si mesmo as muitas coisas que tornam famoso o Havaí - vulcões, lindas cachoeiras, selva de samambaias, arco-íris e, quem poderia esquecer, das macadâmias. Embarque em seu hotel de Hilo entre 10h45 e 11h00. Em seguida, saia para sua excursão de 8,5 horas de viagem para o Parque Nacional de Vulcões do Havaí em um ônibus ou uma minivan com ar-condicionado. Anime-se para ver vulcões, leitos de lava, saídas de vapor e crateras vulcânicas, tudo enquanto ouve as lendas locais sobre como esses fenômenos naturais surgiram. 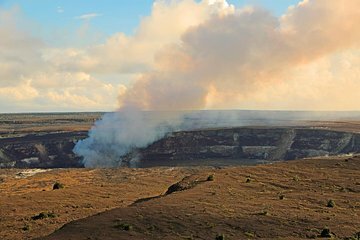 Faça uma parada no Kilauea, um dos vulcões mais ativos do Havaí e tire fotos, especialmente se você tiver sorte para ver o vapor subindo em sua visita. Siga para o Museu Jaggar e o Observatório Vulcânico do Havaí para aprender mais sobre vulcões e suas forças naturais superpoderosas. Caminhe pelo Thurston Lava Tube de 500 anos de idade e fique no mesmo lugar onde a lava derretida tem fluiu anos atrás. Outras paradas incluem o Richardson Beach Park, a Cachoeira Rainbow, o Mirante Kilauea Iki e a Mauna Loa Macadamia Nut Factory (aberta somente durante a semana). Depois de sua excursão chegar ao fim, volte ao seu hotel entre 19h30 e 19h45. Got picked up at the hotel by Hank our guide for the day. Fourteen seater bus and tour guide just for myself and the hubby!! Hank was very friendly, he asked us questions about ourselves and answered ours. On our tour, Hank told us all about the island and more. We got to see a turtle on Richardson Beach, eat lots of samples at the Macadamia Nut Factory and enjoy the views of Rainbow Falls. The weather let us down for our trip up to the Volcano, four seasons in one day. We got to see some nice views, had a walk in the rain through the forest, but no lava seen as the clouds had descended down around us. A really enjoyable day none the less. Will just have to return to do it again!! This was the most amazing day! Susan, our guide, was like a family member who invited us to enjoy her home Hawaii and love for the area. She knew wonderful places for photoshoots, was happy to photograph us, and had great suggestions for interesting poses. She had lots of pictures and news clippings to pass around as she drove and told stories of the history of the Big Island. None of our time was wasted. We went to beaches for photos, to Volcanos National Park at multiple places, including back to the peak for the sunset, hiked volcano tubes, walked over various old lava flows, got insights at the museum, went to the Mauna Loa factory/plantation, and so much more. It was a fantastic, total immersion in the Hawaii experience from sights, to history, to folklore. It turned out to be a blessing in disguise that I had been unable to get a rental car while we were on Hawaii, since this tour took us to everything and more that was on my To Do List, and provided a whole cultural and family-like experience that made me feel like I had spent weeks on Hawaii, rather than just days. I'd do it again as a top priority on my next trip! The tour itself was comprehensive but a bit too long. Although your driver was very knowledgeable, his accent was hard to understand and he provided more details than needed. We got picked up at 9:15 am only to wait at the airport close to our Hotel for over an hour waiting for additional tourists to arrive. It's an once in a lifetime experience, everyone visiting to Hilo to experience active volcano should do this trip. Great tour to the volcano, Rainbow Falls, the Thurston lava tube, the Mauna Loa Macadamia Nut farm and visitor center, etc.! Our tour guide Jeff was so knowledgeable and fun! His informative narration and insights and perspective really added a lot. Our van was spacious and comfortable. Our group ranged in age from early 20's to me 69 and I believe we all enjoyed the experience. This was the perfect tour to start off our trip to the Big Island! Our guide, Bobby, made us all very comfortable, was very pleasant, and extremely knowledgable. We did everything listed on the itinerary and more. It was a great day and we were not disappointed in any way. Junior was great. Very entertaining, knowledgable and respectful.